Brett Luke | The Journal Gazette Patrick Finley of Bishop Dwenger dives to complete a 30 yard pass just short of the endzone during the Class 4A Semi-State game at Homestead High School. Brett Luke | The Journal Gazette Sam Obergfell of Bishiop Dwenger stops Jaeger Gill short of a first down in the first quarter of the Class 4A Semi-State game at Homestead. 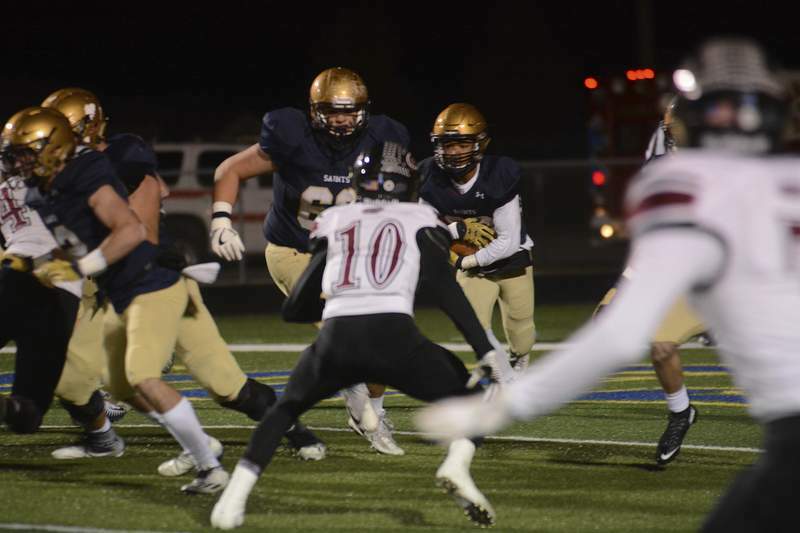 Brett Luke | The Journal Gazette Bishop Dwenger pushes Lowell back away from their end zone during the Class 4A Semi-State game at Homestead during the second quarter. Bishop Dwenger knew fully well what was coming. The Saints just couldn’t stop it. Lowell senior running back Jordan Jusevitch ran for three touchdowns, pushing the No. 1 Red Devils to the Class 4A state finals with a 21-7 victory Friday in a semistate played at Homestead. Lowell (14-0) will face East Central in the Class 4A state finals. The Trojans (11-3) dispatched Greenwood in the south semistate, 27-14. Dwenger (10-4) struck first, marching 85 yards on nine plays, with Patrick O’Keefe’s 9-yard pass to Tommy Steele capping the drive. A bad snap precluded an incomplete pass attempt on the conversion, but a Lowell penalty would give Michael Garrett another chance. The next snap was on target, as was the kick, giving the Saints a 7-0 lead with 1:44 left in the first quarter. That extra point would loom large – at least until just past halftime. Jordan Jusevitch’s 12-yard touchdown run would bring Lowell within 7-6. But with the wind at his back, the Red Devil kicker’s attempt came up short and to the right, letting the Saints maintain a lead they would take into halftime. On the second play of the second half, Dwenger quarterback Patrick O’Keefe threw his second interception of the game. It would take just four plays for Lowell to strike again as Jusevitch rumbled into the end zone from 37 yards out. This time, the extra point was good, and the Red Devils took a lead they wouldn’t relinquish. “They just did all kinds of different stuff,” O’Keefe said. “They changed it up, making sure we (couldn’t) predict what they were doing. They got to me a couple times and forced me out of the pocket. They got a couple picks, and that was the difference”. With the wind whipping across Spartan Stadium, special teams plays turned into a horror show for the Saints, who mishandled five punt and kickoff returns. 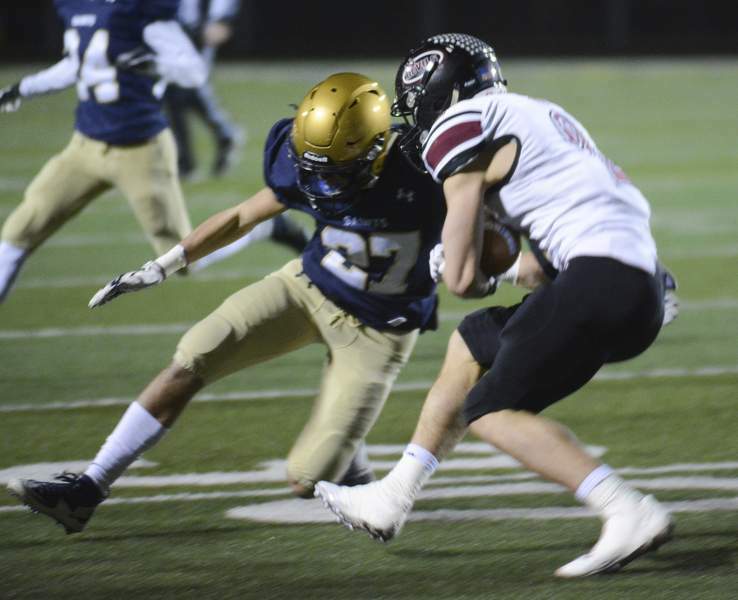 Dwenger narrowly escaped a third-quarter safety, as Alec Watercutter mishandled a wind-aided punt that rolled out of the end zone just out of the reach of a Lowell defender. Leading 13-7, Lowell lined up for another punt early in the fourth quarter. Rather than attempt to field the punt, the Saints let the ball sail overhead in the hopes that they would get a touchback. But a host of Red Devils swarmed the ball, swallowing it on the Dwenger 1. On the next play, Saints running back Chip Clark was tackled before escaping the end zone, giving Lowell a safety and a 15-7 advantage. On the Red Devils’ ensuing drive, a Jusevitch 15-yard run capped a 10-play drive, all running plays, to push the visitors’ advantage to 21-7.